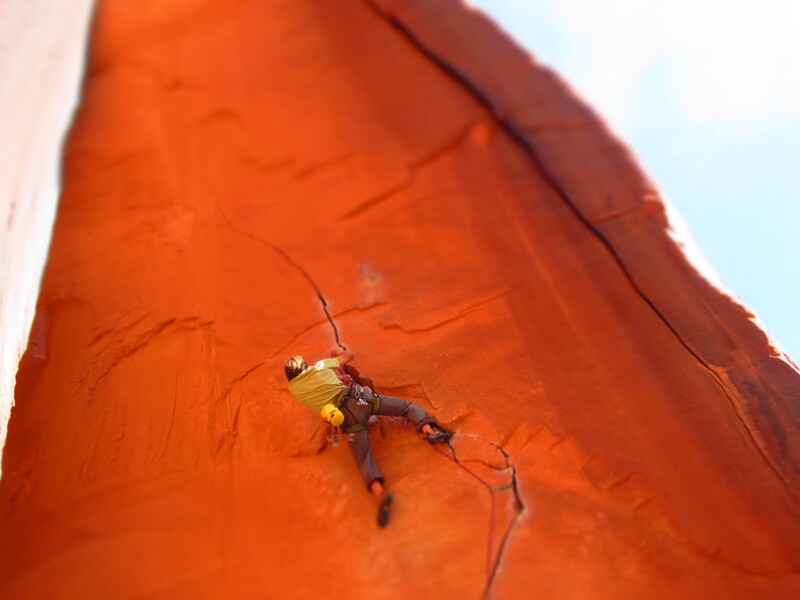 A few extremely belated photos from a two week trip to Utah in November. 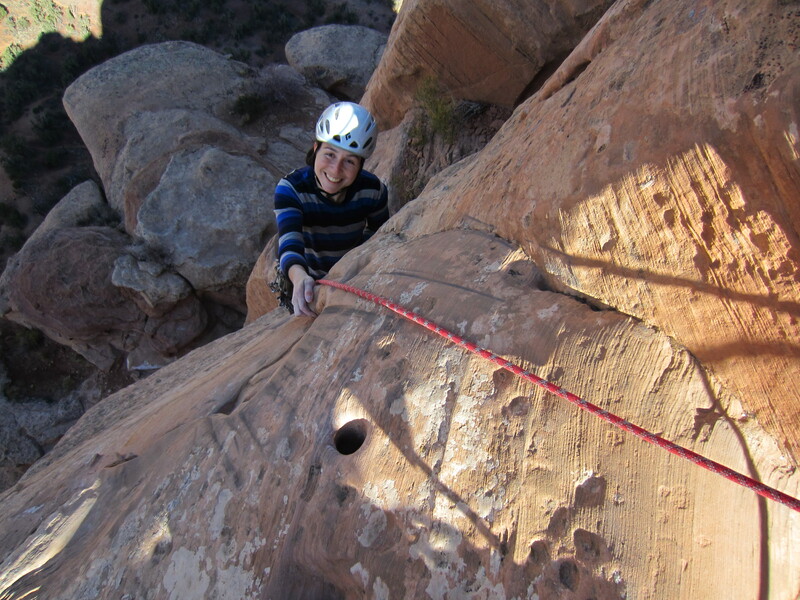 Karina climbing Otto’s Route on the Independence Monument. Note the hole, which would have originally had a metal pipe hammered into it. Not the most inspiring piece of fixed protection. 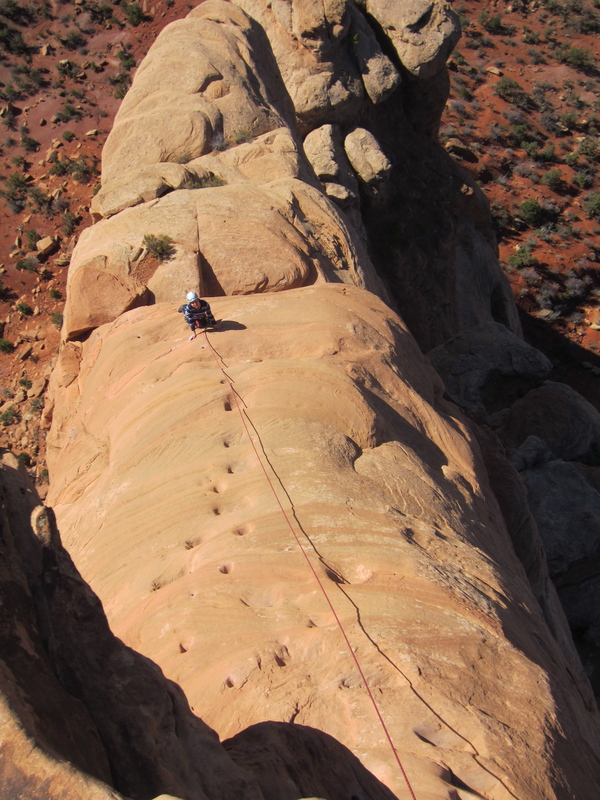 Looking down the final pitch of Otto’s Route. Note the steps cut in the rock. 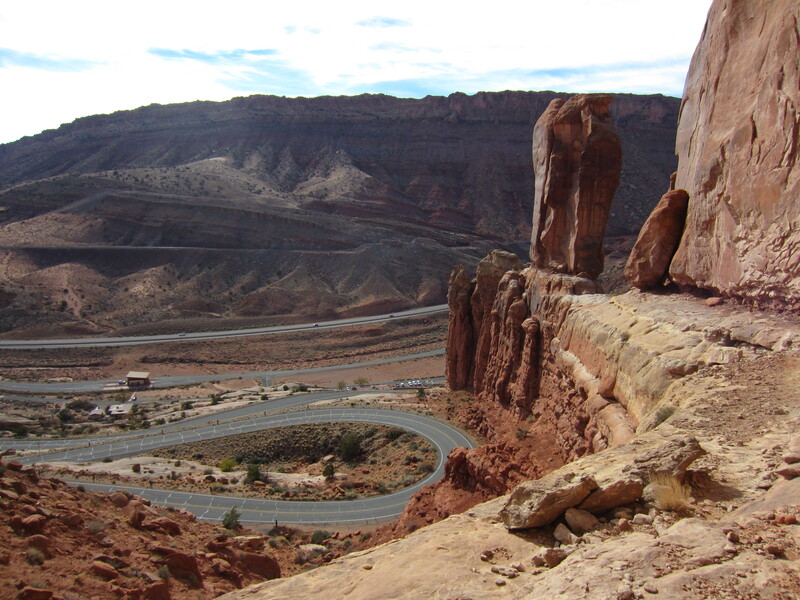 John Otto climbed/engineered this route in 1911. Perhaps I’m biased by the interesting history, but I think this is an example of a route that is actually better for having been “manufactured“. 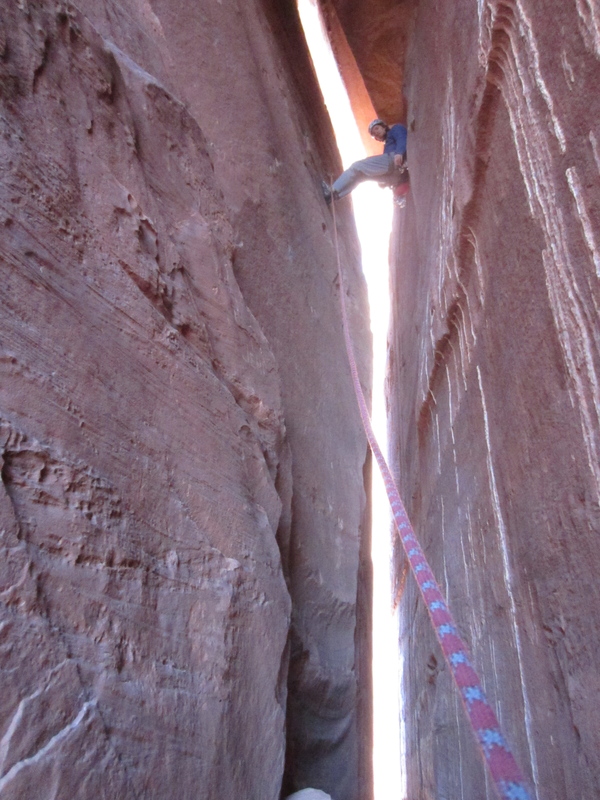 Karina eyeing up a short section of squeeze chimney on the Kissing Couple. This was the first of many chimneys on our trip. 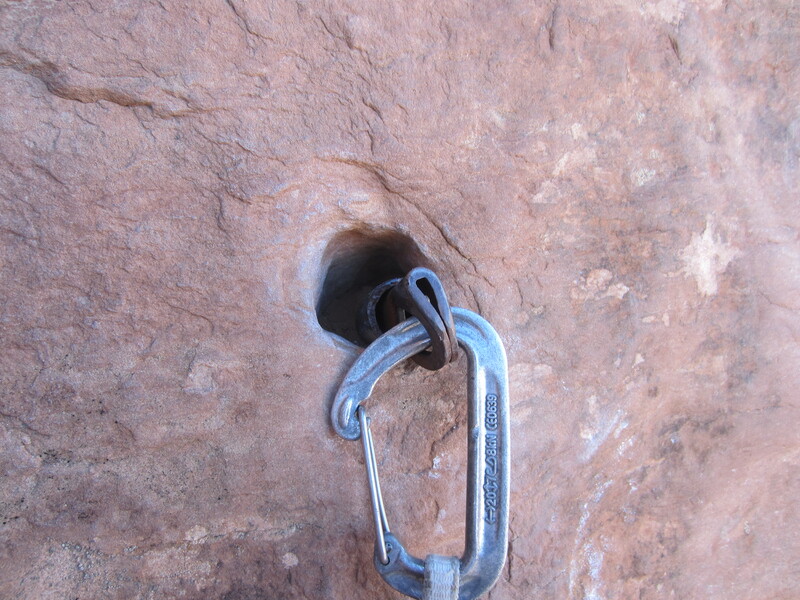 Note the grooves worn into the rock by ropes. 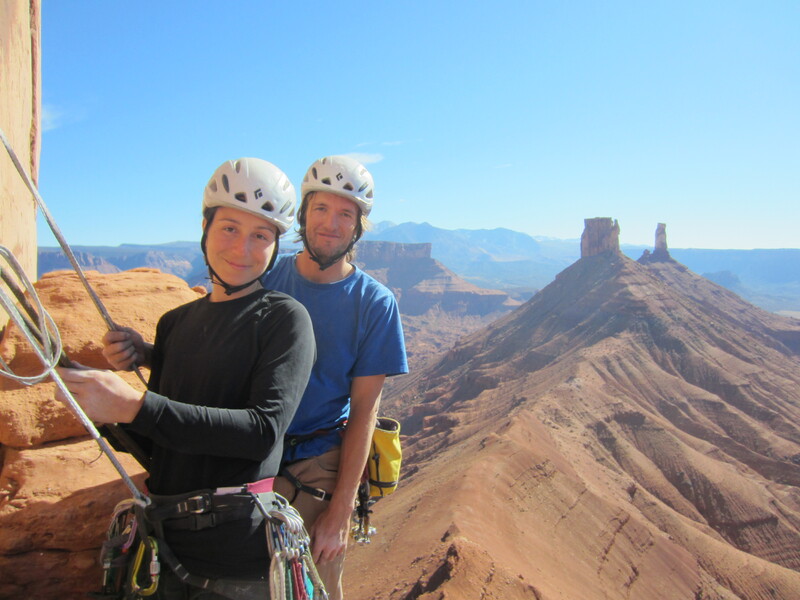 The pedestal belay between the necks of the Kissing Couple. This is where the guidebook recommends climbing with hands on one side of the chimney and feet of the other. This is also where the rock is coated with hardened bird guano, which, once you’ve resigned yourself to touching it, actually gives the holds a nice texture. 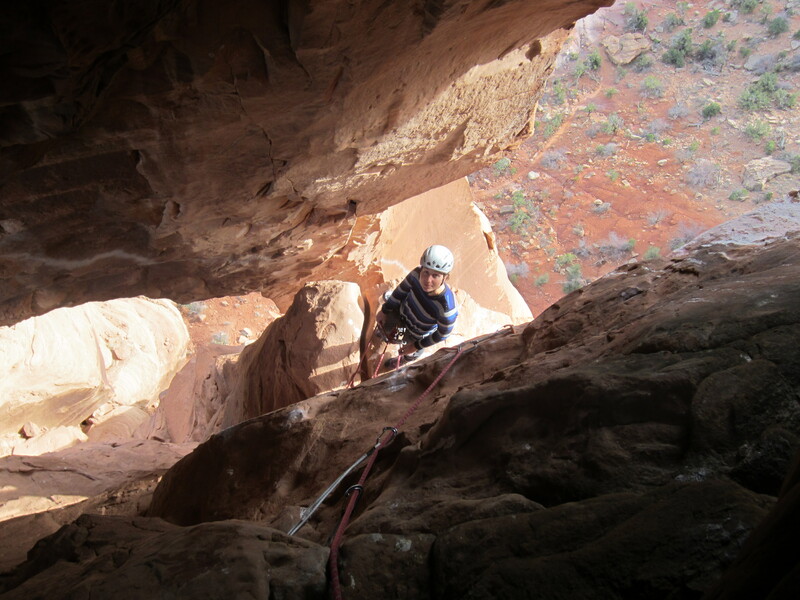 The second pitch of the Honeymoon Chimney climbs inside the Priest and is certainly much more enjoyable than the offwidth and squeeze on the first pitch. In fact, I’m hard pressed to think of a wilder pitch of 5.7. Looking down the NE Ridge of the Kingfisher. 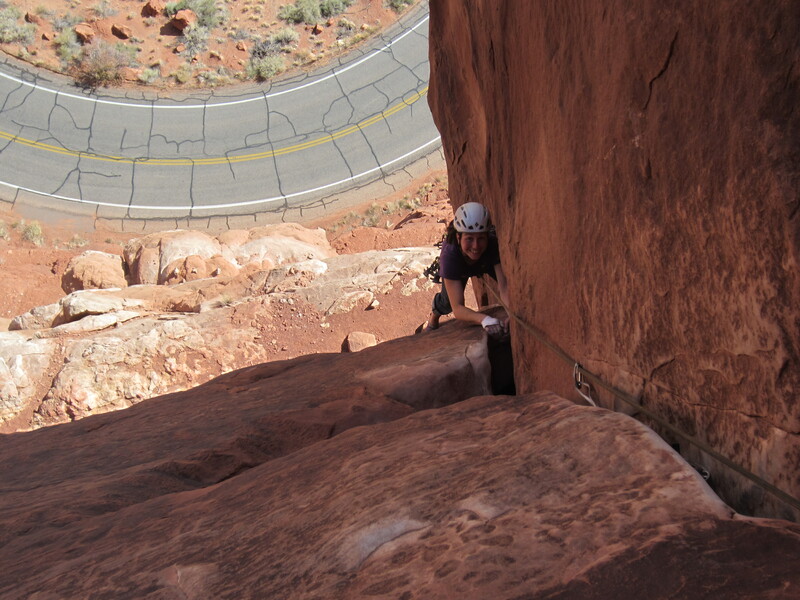 This was Karina’s first real aid climb and she did remarkably well considering that the route, as is typical of the Fisher Towers, was wildly exposed and caked in mud. We topped out in a fairly respectable time of 3:55. Hanging out on our way down from Jah Man on Sister Superior. The Rectory and Castleton can be seen in the distance. 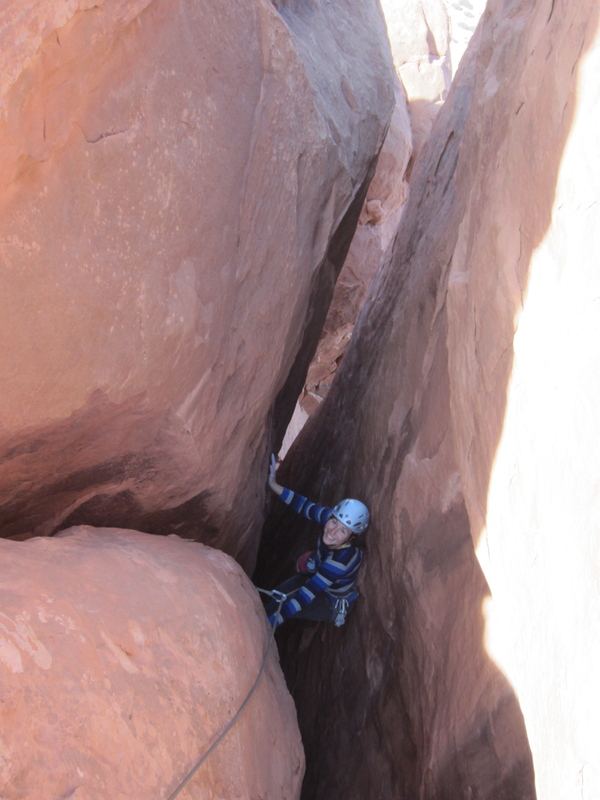 Karina exiting the squeeze chimney of Off Balanced Rock in Arches National Park. I’m not sure why I thought it would be a good idea to climb a squeeze chimney on what was supposed to be a rest day. We also climbed Chinese Eyes and Owl Rock this day, both of which were far more restful. The Three Penguins as they preside over the Arches National Park Visitor Centre. 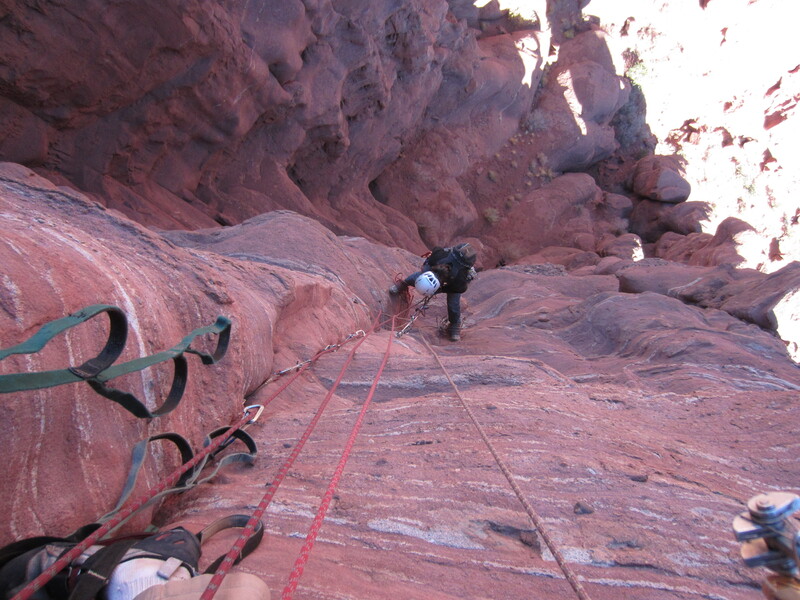 The first pitch of the Right Chimney on the Three Penguins. 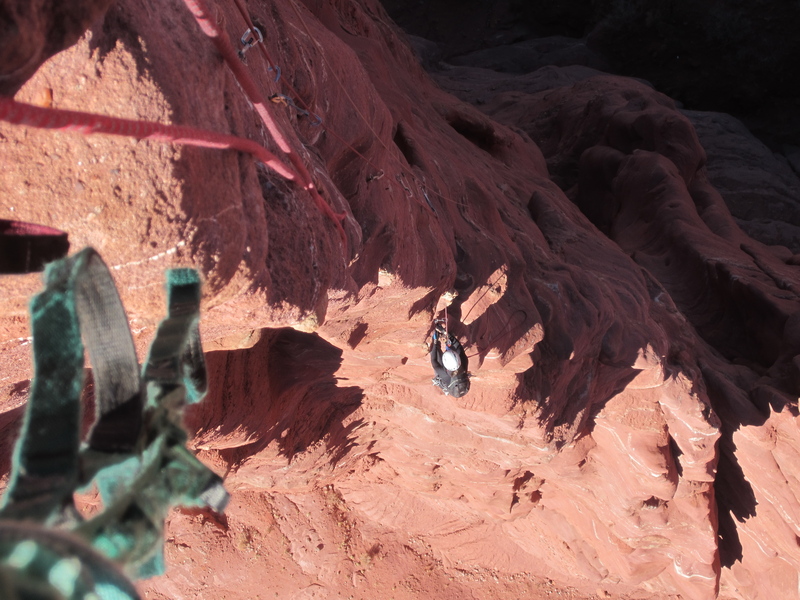 Looking down the lower pitches of the Finger of Fate route on the Titan. I had wanted to do this route for a while and may have somewhat coerced Karina into attempting it even though aid climbing on large mud-coated towers isn’t exactly her idea of a good time. 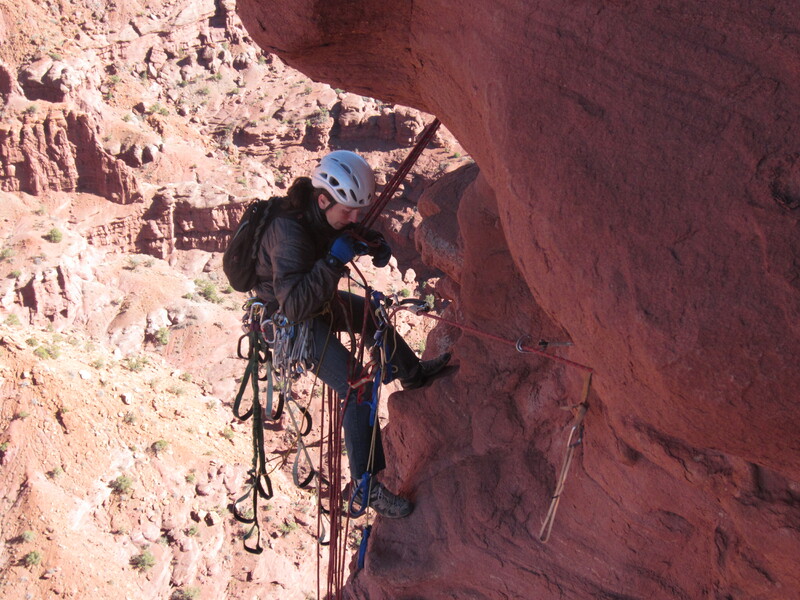 It was Karina’s second time aid climbing and therefore probably not the ideal time to learn to follow traverses. 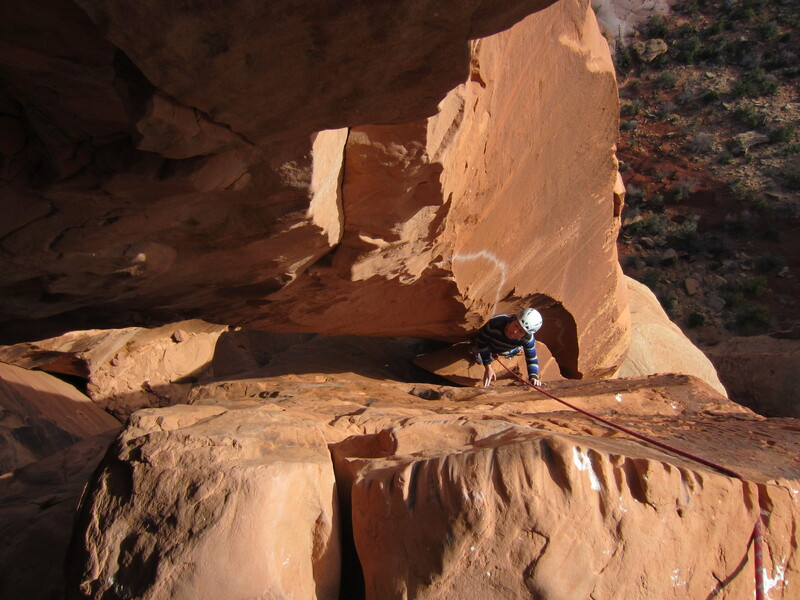 Climbing Annunaki in Indian Creek.